Establishing a profile on the Internet is generally very rewarding. But as your online presence gains greater visibility, you may increasingly find yourself beset with approaches from people you’d rather be harpooned up the backside than accommodate in their self-serving requests. You wrote an article that became a respected reference on a subject? Cool. So long as you understand that “this now makes you a free, on-demand consultant and personal helpdesk”. Or maybe your online presence is more socially-orientated? Nice one! Except that your social assets are not your property. “Unless you give up your time and social skills freely to anyone who requires an interaction, you are officially rude”. If the socially needy want to use your time for the purpose of their own therapy, or counselling, or gratification, or education, then “they should be at liberty to do so, on an ongoing basis, without compensating you in any way whatsoever”. Escaping the freelance rat race to find REAL money in the online world. All total crap. Obviously. Time is money, and that should apply in any circumstance where you’re directly providing another party with value at their own specific behest. But if you were wearily shaking your head throughout paragraphs two, three and four, you’ll be all too familiar with the way the Internet has created a culture of expectation. Those of us who have taken the time and put in the work to build a visible online presence can, if we’re not careful, become victims of our achievement. I’m not saying we haven’t, collectively, fuelled the culture of expectancy and entitlement ourselves – by freely accommodating literally millions of random requests. We have. But it’s obviously not okay for any of us to become online dogsbodies, continually performing chores that offer us no reward, for people we don’t know, and who’ll instantly forget about us once we’ve slaved away in service to them. We should therefore consider how to manage approaches from various parties online – be they demanding, arrogant, or simply unlikely to gain us anything. That’s what this post is about. Whether you respond to an online approach is primarily a question of the likely impact on your state of mind. Are you going to feel happier if you respond, or are you going to wish you hadn’t bothered? This is often quite a complex evaluation to make. The Internet being what it is, responding to requests may bring longer-term rewards, from people other than the requestor. Useful publicity, for example. Even when a proposition offers you no payback per se, your response may serve as an advert for your skills, and connect with people who will benefit you. This was one of the reasons I deliberately pushed my contact facilities into the public domain on social media, and disabled or restricted access via private means such as email. I quickly learned that when I helped people via email, I got no benefit from it. Often, not even a thank-you from the person I helped. Unless they wanted something else. Then they’d miraculously remember to thank me for the thing I did for them three months ago, as they enthusiastically outlined their next requirement. But when I helped people on a public platform, I enhanced my reputation with more than just one person at a time, and I additionally found that the people approaching me were a lot better behaved in their communication. Manipulative or aggressive people tend to be a lot less manipulative or aggressive when they’re under the public gaze. But it’s important to be aware that no one making an initial, unsolicited approach to you on the Internet is entitled to a response. We’re conditioned to believe that it’s rude to ignore people. But it’s much ruder for someone to approach you, and set about procuring some kind of personal reward, without any intention of rewarding you in return. So provided an online approach does not relate to an existing commercial arrangement between you and the person in question, you owe them nothing. You don’t owe them your time (even the small amount it would take to type a one-sentence reply), and you don’t owe them an explanation as to why you’re not prepared to give them your time. It took me a number of years to reach the stage where I was comfortable selectively ignoring people who approached me online, but it’s a vital stage to reach. As time goes on you develop an instinct for the blunt, self-serving takers and ungratefuls, and you don’t acknowledge their messages. It’s fine. Nothing happens. They’re used to people ignoring them. So that was the easy part. Things get more complicated when you do decide to respond. It’s at this point that you need to evaluate what you’re going to gain from responding. Can you learn something? Gain online status? Is the person who approached you in a position to offer you anything in return? And if so, should you be asking for money? The question of money was one I used to leave off the agenda entirely. Initially, I was not on the Internet to make money. I was here to express what I wanted to express, and I felt that commercial interest could negatively impact on that goal. But once people started asking me to create substantial content for them, I realised that the only two reasonable options were to decline, or to require a fee. Agreeing a fee is difficult at first. Of course, some people expect your time and work for free. They may attempt to ‘compensate’ you with something that’s woefully short of your expected contribution in terms of value (like a name credit that’s not realistically going to gain you anything). They may even be outraged that you had the audacity to allocate a value to your time and/or expertise. From personal experience, I’d suggest paying little or no attention to those who request any service from you without first asking what you charge. If they’re not asking what you charge, they’re expecting you either to work for free, or to be so malleable that THEY can decide what your time is worth. Either way, they’re looking for an online dogsbody – not a service provider. Even assuming that the person or business approaching you has asked what you charge, without prior experience it’s hard to know where to set the bar. Broadly, the advice is to make a quote, stick to it and refuse to negotiate. But especially for beginners, that’s not as easy as it sounds. Quoting realistically must take into account your experience (or the lack of it), how much competition you have, whether your potential client is aware of your competition, what you believe the potential client can afford, etc. And if weighing up these factors is something you’ve never done before, it’s easy to get things wrong. Quoting unrealistically high, and then sticking to that quote, is obviously not going to result in a deal. Ironically, the less you care about doing the work, the better the deal you’re likely to get. If you can sincerely say: “Take it or leave it”, the potential client has two options. Pay your price, or take a running jump. If your price is exactly right, it won’t matter to you which option they take. If they accept, you’ll be fairly compensated. But if they decline, you won’t be left feeling you should have pitched lower. HOW TO TAKE THE MONEY? If you read the advice of professional online content or service providers, they’ll frequently say you should demand your fee before starting any work. In a way, that’s sound advice. I learned whilst writing for national magazines (in my pre-Internet days), that even supposedly reputable businesses can pay less than the agreed amount, or simply not pay for elements of content at all, if you don’t take the money up front. However, it’s also very idealistic advice, from big-name creators who have the reputation, clout and chutzpah to make such bold insistences. In lower profile territory, it’s going to be extremely difficult to insist on an advance fee for online content. Even some of the well-established online creatives admit it’s normally impractical to require fees in advance, and/or that the amount of work they’d lose in so doing would be prohibitive in the extreme. Of course, if you already have consistent work and can afford to be turning people away, go ahead and demand payment in advance. That way, provided you don’t use payment options like PayPal (which basically allow service consumers to mandate refunds over very long periods of time), all your work should be properly paid for. But you should know that insisting on payment up front WILL lose you a lot of business. Don’t forget, it’s as difficult for potential clients to trust you as it is for you to trust them. Maybe more so. What if they pay up front and you fail to deliver the content? Unless you can PROVE you’ll deliver, they’re always going to have that doubt, and unless you’re very well known and trusted, most won’t take the risk. If you’re just getting started and you do recognise that some negotiation might be required, be prepared with a red line, which you absolutely will not cross. Otherwise, you may just be agreeing to more and more, for less and less, and diving ever-deeper into Dogsbody Ditch. There’s a reason why this person came to you, unsolicited. They saw you as a means of skipping round the professional service providers. If they were expecting to pay full whack and adhere to a professional’s terms, they would have made life easy for themselves and gone to a commercial supplier. So you can be sure they’re going to push you, beat you down – try to essentially get something for nothing. You have to be ready for that. Never expect anyone who approaches you unsolicted on the Internet to be content with market conditions. They’re trying to bypass the market. That’s why they’ve come to someone who hasn’t advertised and doesn’t appear to be a commercial operation. But this doesn’t make you powerless. One rule low profile content creators can (and definitely should) stick by, is to release no more than one piece of content in the first instance, and then ensure full payment is made before releasing the next. That sounds obvious, but many requestors will hit you up with the old “We’ll pay you after five articles” line, or “We pay quarterly”, or whatever. Fine. You pay quarterly, I’ll write quarterly. Another good idea for writers not used to commercial work is to restrict the length and parameters of an initial submission, but promise much grander subsequent works provided payment is made as agreed. You don’t have to be coy about this. It’s perfectly reasonable to state that you’re wary about investing a lot of time in a first submission. They don’t trust you enough to pay in advance. Why should you extend unlimited trust to them? And remember, they approached you – UNSOLICITED. It’s useful to remind them of that if they complain about your terms. You never advertised or made any claims. And it’s YOUR value to ration or restrict as YOU please. . It can be a lot harder to request money for social communication, which has no piece of content as an end product. One of the keys to suggesting that people pay to talk to you, without them throwing a mini-tantrum in response, is to work out a regime of language that primes their expectations. “Consultation”. It’s a single word, but it creates an expectation that a fee will apply, in a way that the terms “talk” or “chat” do not. If you find a lot of people approach you for advice on things, slip the word “Consultant” into your online bio. Then you’re priming those people to expect to pay for your advice. “Therapist”. If the demands on your time tend to be more focused around emotional matters, that might be a more suitable primer. But again, you’re using language to imply that your time and skills do not come free. Managing expectations. As soon as a conversation starts, use your chosen business language, and be prepared to draw a line on where an introduction ends, and a service begins. Identifying the likely stroppers at first base and ignoring them altogether. This is another reason why driving your communication out of private email and onto public social networks is a great idea. On social media you can check out someone’s past behaviour when they approach you – see if other people respond to them, see how they’re perceived, how their previous interactions have gone. You can’t do that with email. You don’t get any history. Aaaaagghhhh!!! “Share” – the outright most manipulative word in a high-end sponger’s vocab. I’ve been asked a number of times to ‘share’ the programming code for my virtual musical instruments. What, so you can go off and sell the fruits of two years hard work? Yeah, of course I’ll be happy to donate all that labour to some complete stranger who crept out of the depths of the Internet, and who blatantly wants to monetise it for himself. NOT! Never forget that the people approaching you are using these words quite deliberately, and be firm in asserting your own language in response. Asking how you can be of service to people who won’t make clear their goals, and then ignoring any further smalltalk until they explain what they’re looking for. Restricting what you’re prepared to provide for strangers or people whose integrity you can’t verify. Indeed, if you’re dealing with people you’ve never heard of, DO demand payment up front, DON’T accept PayPal or any other payment means that takes refunds out of your control, and don’t do any work until the money is in the bank. If you’re dealing with businesses you can check out, search for any online stories of non-payment before going any further. If they come up clean, proceed with caution, and break down any large requests down into stages, each of which must be paid for before the next begins. None of this means it’s wrong to interact with, or help people on the Internet for free. The Internet incorporates leisure associations, just like the offline world. If it makes you happy, do it. But if someone else’s gain is not also your gain, then you should impose balance upon that equation. 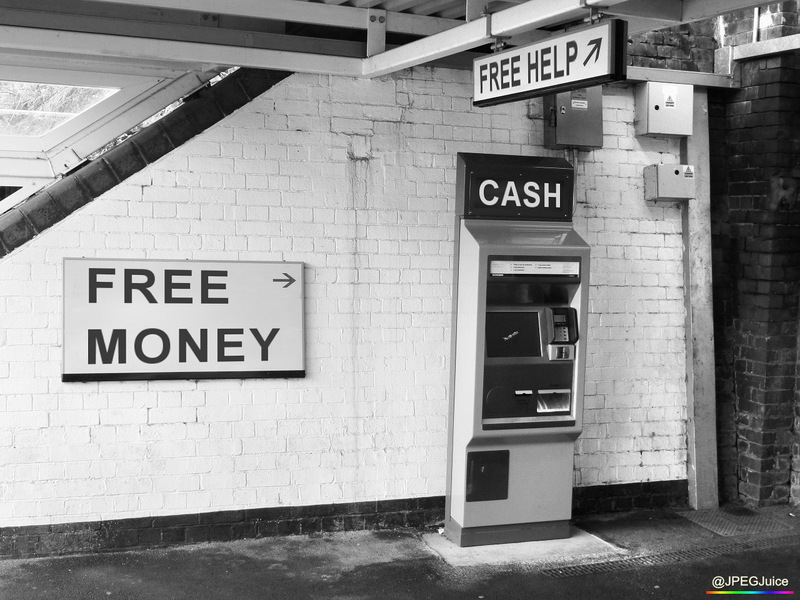 If your ‘help’ is ultimately going to generate money or provide a benefit for someone else, then it’s not help – it’s a service. But in truth, my belief is that in general, people who approach you with propositions online, will not be intending to give you a good deal. You always have to consider: why me? And if the people approaching you had other, obvious commercial options available to them, the answer will almost inevitably be that they didn’t want to pay the going rate. Or, in many cases, didn’t really want to pay at all. Taking your talent to targeted people, is better than waiting for the cheapskates and self-servers to come to you.